Strive for Five – Bruce Zimmerman . . .
For the sales person, it only makes sense to utilize this number to your advantage. Why? It’s a powerful yet simple number. Generally speaking, most people think this way and it’s easy for most to focus on or remember five points. When I first started in sales, my mentor shared with me what he called his “Rule of Five”. He referred to it as his “secret sauce” of sales success. With today being 5/ 5, I thought it would be most appropriate for me to share his wisdom, and a little bit of mine, with you. It’s what I call, Strive for Five. Start your day, each and every day, before you walk out the door, with five positive thoughts! They can be any five you want, after all they are your thoughts, but make it five positive thoughts. Oh, by the way, revisit these five thoughts five times during your day. It will help to keep you going even if things aren’t going your way. Come up with five different methods of reaching out to or communicating with your clients. Change up your routine,when cold calling / prospecting, break it up into, you guessed it, fives, make five calls then take “five”, then do five more. Have five different talks tracks or messages prepared to leave on voice mails. In the case of objections, for the most common ones that you face, have five ready responses. Prepare and utilize five key proclamation statements (thank you Ron Karr) for your product and or service. Have five success cases that you can reference and the five benefits that were realized from your offering. Have five different methods for thanking your clients for the business. From a personal branding standpoint, it’s important to remember you are being judged on 1) how you look, 2) how you act, 3) what you say, 4) how you say it, 5) where you say it. Read at least five blogs or articles a day. Make at least five comments, on blogs or on groups in LinkedIn. Depending on your particular circumstances or role, strive for five new prospecting calls. Invest at least 5 hours a week in your Professional development. Take five meaningful and actionable steps toward the accomplishment of goals. Make five new connections a week. Reach out and talk “live” to five of your social media contacts a week. The “Rule of Five” has served me well over my career. It has helped me to keep me positive, focused, and energized. Hopefully, this little bit of advice will help you along the way on your path to success. By the way, there are Five points on a Star. Coincidence, I think not! If you want to be a Star, Strive for Five! If you liked this post, how about a high five? ‹ The Luckiest Man . . . Thanks for stopping by and for your comments. They are much appreciated! What’s your “strive” motto? Even on days when I am slacking, tired or just want to veg on the couch, I commit even just half an hour towards moving my online aspirations forward! Thanks again Bruce. And I though that three was the magic number. “Oh yes it is….” I don’t know if ou remember that sing from the early 90’s. Interesting post. Especially the 5 W’s of questioning. Thanks for taking the time to read this post and for your comments. Not sure what song you’re referring to. Can you maybe hum a few bars? 🙂 Let me know actually what the song is. I’m ashamed to say that it was De La Soul. See if you can sit through the full 3 minutes of this youtube clip http://www.youtube.com/watch?v=0irL1M15DH8 . The hook really got me but I now realize that I won’t be any worse off if I never have to hear this again in my life. Sorry to inflict this on you. Great post. 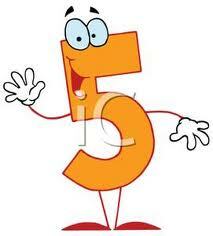 I love the idea of 5, because it pushes you past the easy first couple. Once you get to idea number five, you are really reaching the creative ideas. Great tips for goal setting as well. Erik, thanks for your comment. Everyone has their own “magic number”.For some it’s 3, for others it might be 1 or even 2. For me it’s Five! It helps push me past the ordinary and average. As you put it, once you get to five, you are really reaching for the creative ideas. Push for excellence my friend!